Marble is considered a metamorphosed limestone. From a flooring and refinishing perspective it is in the same family as travertine, limestone and onyx. 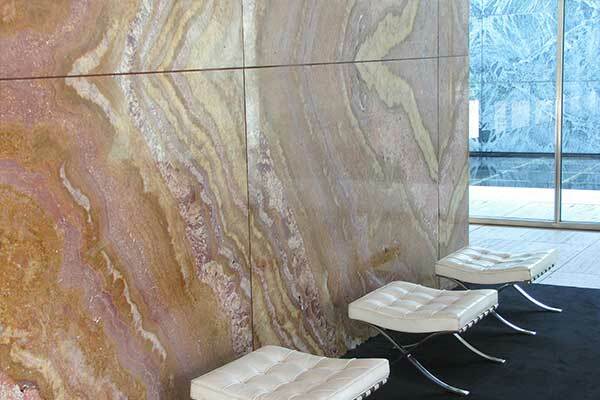 It is a very popular stone type for floors and vanities. As a calcareous stone, it is susceptible to acid etching. It is generally soft so it may be easily scratched. Often times, when a marble surface looks bad, it is as a result of wear across heavy traffic areas and acid etching. At etch is a dull mark that is left on the surface of the stone. The mark is a result of a chemical reaction with an acidic solution. Most often etches look like drops of water that will not clean off or rings from the bottom of glasses. Some people call these marks stains. Etches are often a result of common household items and the marks left by them are superficial to the stone. Due to the superficial nature of most acid etching they can be removed with light diamond refinishing. Once the refinishing is done the surface is ready for the final finish whether a polish or hone. The issues that marble faces show up on both floors and countertops. Etching is more wide spread on countertops because of the consistent contact with moisture and potentially caustic chemicals. Floors are very commonly degraded by scratching from foot traffic. Especially in entry ways and hallways that connect high use areas. To get rid of scratches we use the same process used to remove etches. We diamond refinish the surface progressing through grit levels preparing the surface for the desired finish.